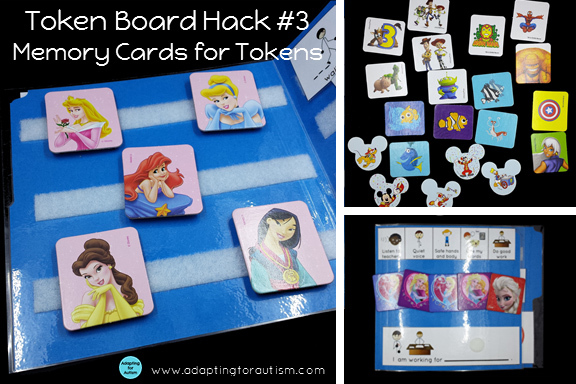 Token boards are a staple in many special education classrooms. 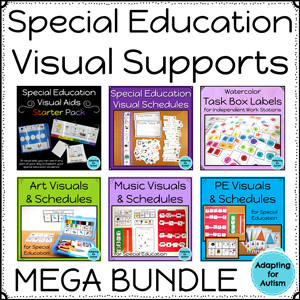 Token economies are a best practice and appeal to students with autism because they are a physical and visual representation of positive reinforcement. There are many ways to put together your token board. I’m sharing 3 hacks to help you maintain some sanity with this crucial part of your behavior management system! Instead of simply laminating a piece of paper or cardstock, use a file folder. They are far more durable and provide extra storage space. Rather than having tokens in your pocket, you can keep them inside the folder. Very few of my students ever attempt to give themselves tokens but you can take them out if necessary. As your student works through the day with different staff, the token board has everything they need. You don’t need to remember to hand the speech therapist the 3 tokens in your pocket as they leave your room! You can also keep your reinforcer icons inside so they are always available. Occasionally my students change their minds about what they’re working for and having the icons inside allows them to make a quick switch. Keep your tokens on the left side and your reinforcers on the right side. Use a not available flap inside your token board. This is simply a laminated sheet with “Not available” and/or the “No” sign. Add Velcro to the back of this flap and to the bottom right of the inside of your folder. See the picture below for clarification. 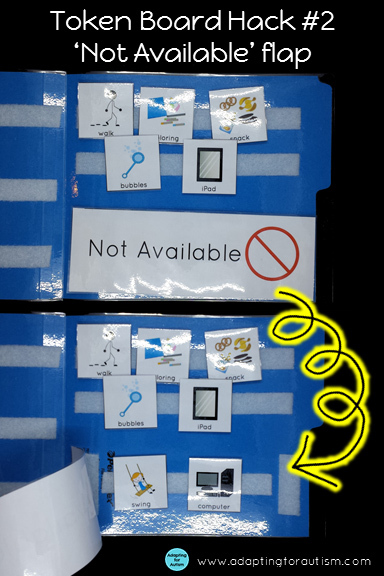 This not available flap helps your students who have reinforcers that can’t travel with them (example: you won’t have access to your classroom sensory swing while in art). Place the icon under the flap so you don’t lose it. Your student also sees it isn’t gone forever; it just isn’t a choice at this time. Use preferred characters as tokens. Poker chips are good options because they’re so durable (and cleanable!) but they’re kind of boring. And perhaps the perfect sized choking hazard if your students put things in their mouths. Another option is to use pictures of preferred characters. You can print character pictures from Google Images or you can use these Memory/Matching game cards. These games are pretty common at the Goodwill so you can easily build a cheap stash. Even better, you can use the rest of the cards to make a matching, patterning or sorting work task! 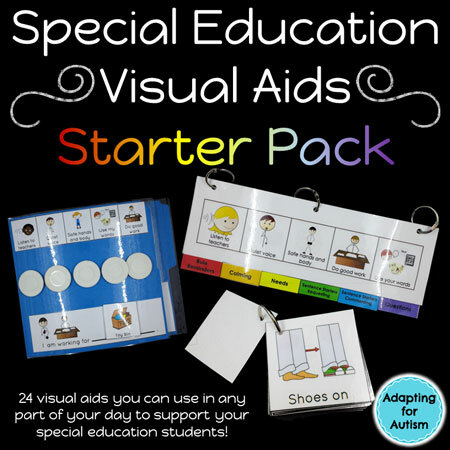 A one-page printout of a token board is found in my Special Education Visual Aids Starter Pack found in my store. 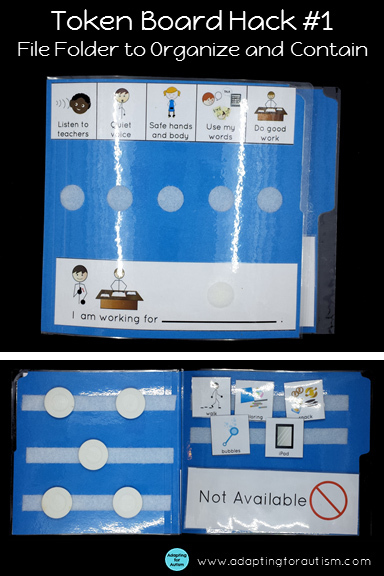 It includes rules, an “I am working for” strip, a few common reinforcers and a not available flap.